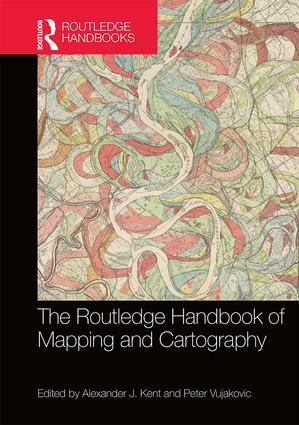 Hot on the heels of the Routledge Handbook of Environmental Justice is th e Routledge Handbook of Mapping and Cartography. The handbook was edited by Alex Kent (Canterbury Christ Church University) who is currently the President of the British Cartographic Society and Editor of The Cartographic Journal; and Peter Vujakovic (also from Canterbury Christ Church University) who edited The Cartographic Journal. Like the other handbooks, this is an extensive collection of 43 chapters and almost 600 page about maps and mapping. The chapters provide a vivid demonstration that cartography and map making is art and science, and that it links to many sciences and practices – from cognitive psychology to geodesy. The list of authors is impressive and includes many of the people that are shaping current cartographic research. However, with a price tag of £175 for the eBook, this collection is expensive and suitable for university libraries and to professional or commercial mapping organisation. Luckily the policy of Routledge permits sharing the chapters on personal websites. My contribution to the book is in a joint paper that was led by Vyron Antoniou titled VGI and Beyond: From Data to Mapping. The chapter is building on a collaboration between Vyron, myself and Cristina Capineri during the COST Action on Volunteered Geographic Information (ENERGIC). In the chapter, we look at the concept of Volunteered Geographic Information (VGI) within practices of mapping and cartography and we attempted to provide an accessible overview of the area. We define what VGI is, provide an overview of the area, look at the advantages and disadvantages of VGI in mapping and cartography, and then look at the impacts of VGI on national mapping agencies, the public, and public bodies. The chapter is available here and we would be very happy to hear comments on it.